Borghetto is stunning any way you look at it. This tiny village – more like a cluster of old mills and a 14th century bridge – on the outskirts of the small town of Valeggio sul Mincio is still one of my most favourite places in Italy almost two years after I first came across it. And I am not alone in my praise and admiration. For Borghetto is one of the I Borghi Piu Belli d’Italia – the official list of the most beautiful villages in Italy. 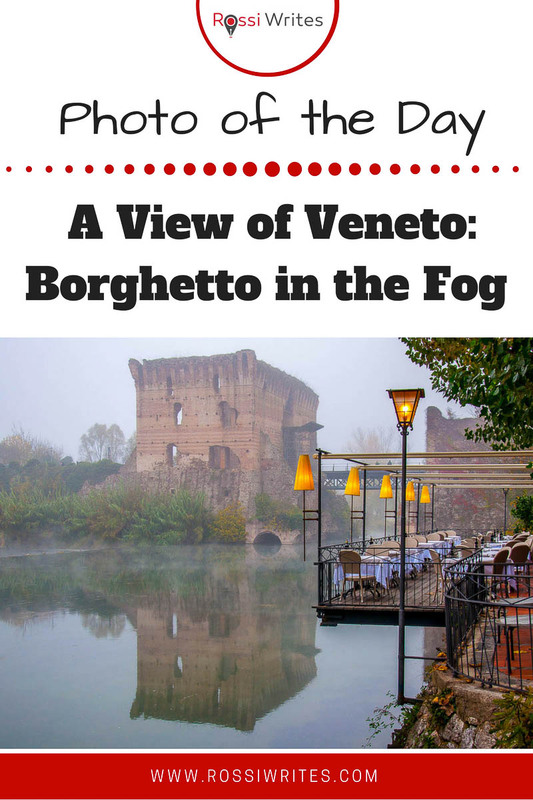 It includes only six villages in the Veneto with Borghetto being one of them. you need to take outside of the big Italian cities (Verona being the closest one) to appreciate the beauty of Italy at its most genuine state. Borghetto’s mills – nowadays turned into restaurants serving the famous local tortellini – huddle one next to another on the fast flowing river Mincio, their old and battered wheels still furiously turning. The medieval Visconti bridge stands tall and proud over the river. in the first part of my list with family-friendly walks and hikes up to an hour and a half from Vicenza (see point 2 here). So, I am not going to take up your time listing the same things again, albeit they are the main reasons for you to decide to go there in order to experience all that beauty for yourself. Enveloped by fog and still looking ravishing in the atmospheric autumn light. I took this photo last Sunday, when we visited Borghetto for its Castagnata – a local chestnut festival. It was very foggy and rather cold. The first truly cold weekend for this season, with the humid air penetrating through the bones and making us shiver in our thick jackets. Still, it was worth it for seeing Borghetto again. This little place in Italy forever has my heart. I waited to make sure that there were no cars passing on the bridge and experimented with my viewpoint by taking a few shots moving the camera slightly left to right and zooming in and out. I feel that this particular shot worked the best. I processed it in Lightroom, upping the whites (+40), shadows (+50), clarity (+50), vibrance (+50) and saturation (+100). Yes, it sounds counter-intuitive to increase both the vibrance and the saturation, but the fog had really drained the landscape of all colour, and I wanted a bright, attention-grabbing focal point, which was provided by the orange lights. I reduced the highlights (-100) and the blacks (-45), and then sharpened a bit.